Bethel Woods Center for the Arts, is an oasis nestled in the Catskill Mountains, about two hours northwest of New York City, at the site of the 1969 Woodstock festival in Bethel, New york. It hosts a wide range of events from April through January and its museum, The Museum at Bethel Woods, is dedicated to the study and exhibit of the social, political, and cultural events of the 1960s, including Woodstock, and the preservation of the site and artifacts from that period in music history. 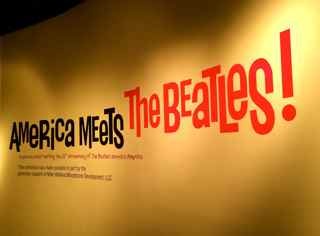 In celebration of this year’s 50th anniversary of The Beatles’ arrival in America, the musem has launched a special exhibit, America Meets the Beatles! 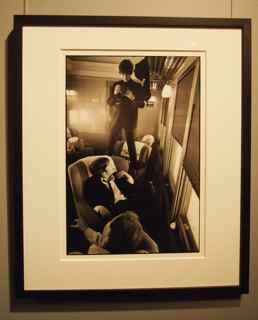 On Thursday, I was invited to take a sneak peek at the unique presentation, which is actually two exhibits in one, featuring photographs from Life photographer Bill Eppridge and memorabilia from local collector Rod Mandeville. Eppridge’s photos come with their own fascinating story. He was assigned by Life to cover the Fab Four’s arrive in the US for their iconic appearance on The Ed Sullivan Show. He was so impressed by the group and their scores of screaming fans that he arranged to follow them for the next six days shooting intimate photos. The Beatles traveling by train on their first US trip. The magazine published four of his photos and then lost all of his negatives. The negatives were found more than a decade later, after The Beatles had already broken up. Useless at that time, Eppridge set them aside. Therefore, many of them have never been seen by the public. Unfortunately, he passed away before the exhibit was completed, but his wife carried on with the project. 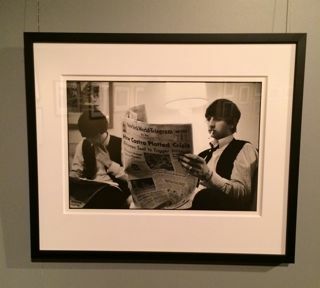 Ringo Starr reads about the ongoing events in 1963. The photographs are a compelling behind-the-scenes look at what that first US tour must have been like for the boys from Liverpool, revealing intimate glimpses of their excitement in the first few days of the British Invasion. They also give a window into the cultural and political climate at the time. Rod Mandeville of Jeffersonville, New York, may be one of the biggest Beatles collectors in the US. His home is teaming with memorabilia including posters, pins, fan club mailings, figurines, fan magazines, and much more. Some of these items form the heart of the other half of the exhibit. You can also see an actual suit worn by Paul McCartney in 1963, on loan from another private collection. One of my favorite displays was the 1960s living room, complete with an antique television showing the Ed Sullivan Show and old magazines you can thumb through, including the TV Guide from the week of the Beatles first US television appearance. 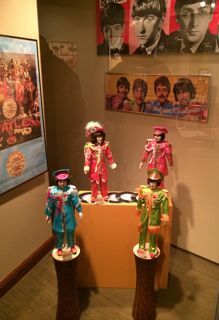 Part of Rod Mandeville’s collection of Beatles memorabilia. The America Meets the Beatles! exhibit runs through August 17, so you have all summer to visit. To support the exhibit, the museum will be hosting several speakers who are Beatles experts and showing several Beatles films, including Good Ol’ Freda this Saturday. The direct from Broadway show Rain—A Tribute to the Beatles will be performed in June. Check the Bethel Woods Center for the Arts website https://www.bethelwoodscenter.org for a complete list of this summer’s events and concerts, as well as museum hours.